When Professional Services are needed, consumers typically know what they need, but don’t know how to find the best person or company for their needs. Whether the need is for a lawyer, accountant, realtor, architect, engineer, actuary, inspector, consultant or any specially trained and/or licensed professional, the first place they will likely look is the Internet. If someone did a search for your profession or was referred to you, what would they find – information provided by you or a third party? 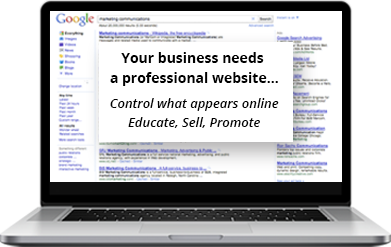 A professional website for your business gives you the control. There is no shortage of qualified professionals who could do the job, so how do you set yourself apart from the crowd? In today’s market, the fastest way that people find a professional service (if they don’t have a personal recommendation) is by searching on their phones, tablets and/or computers. A quick Google search and instantly they have the experts that they are potentially looking for to browse and review. If you don’t have a website that educates consumers and potential clients about your business, your competition may get the business instead. An informative website for your business, properly engineered and designed to showcase your services, will provide your potential client base with the knowledge they need to make an informed decision. Write content for your website that educates the consumer and your potential clients. You are the expert in your field and when you share that knowledge, you instill trust, credibility, and consumer confidence that your company can handle the job. Providing background information on your company and personnel is important content for your website. How you got started, special training that sets you apart from the competition, office locations, hours of operation, etc. Do you have a mission statement? If not, we can help you create one. As they say, pictures speak a thousand words. If applicable, show what you do with a photo gallery! Before and after pictures resonate with consumers and get them excited when they see actual results. It’s also a nice way to show potential clients what you can do for them. Your website works for you 24/7. It should communicate important facts about your services and business, provide a call to action, offer easy to locate contact information, and must be user-friendly. There is a lot of competition that you are facing and your website can provide valuable information to help grow your business. You can’t control negative reviews someone might find online about your business (we suggest you respond to them if it happens), but your website can prominently include positive feedback from satisfied clients. Silverwood Studios will create your professional business website using a content management system such as WordPress, so that you will have the ability to update your information quickly and easily right from your office or anywhere you have Internet access.